This morning when I was praying… I saw a beautiful vision of the crowns on Jesus head. Some were the most dazzling crowns ever and some were plain. 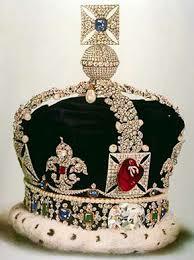 There was a very small crown and then a bigger one and a bigger one… all fitting inside each other perfectly. I saw the crowns were on Jesus head. There were many more crowns all around Him and He was looking very glowing majestic. He had on Royal looking robes and all that He endured on the cross for us was in my heart…but when I saw Him like this I knew and understood the honor His Father God has bestowed on Him and the power and authority over all. He is truly the King of Kings and the Lord of Lords and one day every mouth….every lip….and every tongue will tell the truth of who He is… whether they want to or not. Let me tell you about our brother Jesus Christ. He came to this earth and was born of a virgin woman named Mary. He came here to save us from eternal damnation because of original sin and also to give us a prosperous life while we are down here on earth. He also sent us a comforter when He left. While Jesus was here….they mocked and scorned Him. They beat Him and crucified Him. They put a crown of thorns on His head and laughed at Him because the people said He was the king of the Jews. Little did they know or want to accept that He is not only the King of the Jews but King over all the earth and heaven. 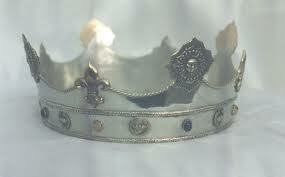 Any crown that ever existed and will ever exist anywhere in the entire universe belongs to Jesus Christ. This is why Jesus has many crowns. Jesus deserves all the thanks and praise from us. We owe Him our lives as worship and thanks for all He has done. I know there is a crown for me when I get to heaven….but I would like to symbolically in my heart and mind throw it at His feet now. 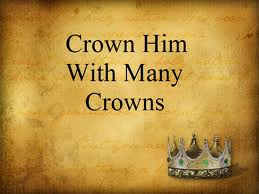 (My symbolic crown is my life and my service to Him) He is so worthy of all my praise and adoration!!! I grew up loving this song and searched Youtube until I found one close enough to the majesty that I feel about the King of Kings Jesus Christ. I pray you take time to listen to it and think about Jesus sitting on the throne in all His Glory. Thank you for your words of encouragement! God bless you! Thanks for this post Tanya. I learned many hymns and gospel songs growing up, and I’m so thankful for them! I also really thank you for searching YouTube for this majestic rendition of this great hymn. As I listened I felt God’s presence and worshiped Jesus from my heart and with lifted hands. Oh praise the Lord Tricia…praise Him! God bless you! Tanya, Once again I thank you for a wonderful message, Our Lord Jesus Christ is so worthy of all the crowns And I also love that hymn! Praise the Lord our God! God bless you Linda! I enjoyed your message, and yes as part of The Godhead or Trinity as The are called today Jesus is The King of kings and Lord of lords, He is also The Living Word, as the Scripture you shared tells us in the next verse and this is also confirmed in John1 and other Scriptures and it is very important that we know He is. God bless you Tanya as you seek the Lord with all your heart. One of my many favorites as well – as I sing the song it truly does awaken my soul! Praise and thanks to God for how He has made it possible for me to know I have Christian sisters out there longing to share what He has laid on their hearts. Thank you for sharing with me, Tanya. I am amazed that you like the same kind of hymns and Scripture passages that have always been a blessing to me. When I was a little girl and in Sunday School or church I would sometimes be so touched by a sermon or hymn that I would be crying. When I opened my eyes I saw other girls looking at me and making fun of me among themselves. I was an adult before I had a friend who also has a love for Sunday School songs and hymns and sharing in God’s Word. We are still friends, but she lives in another state – Florida. So we can only fellowship with one another by phone. Now I have met you, and I am so thankful. Oh, and when I said I didn’t know how to begin, I mean I don’t know the first thing of how to set up a blog.